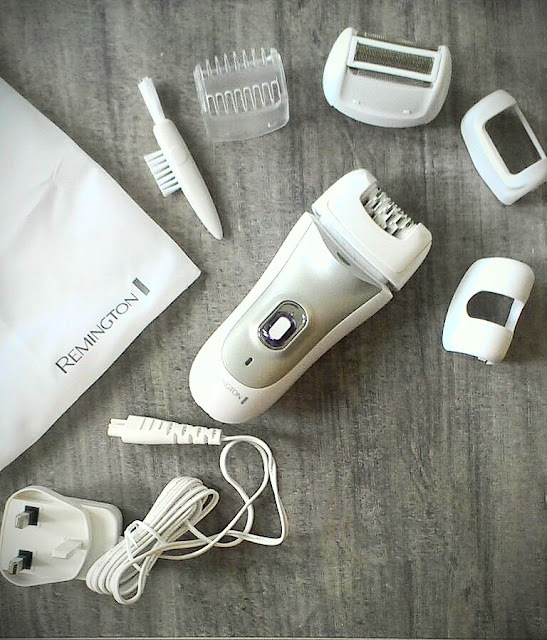 I don't normally do non-fashion reviews that often but when I got the chance to try out the Remington Smooth and Silky, 5 in 1 Cordless Epilator, curiosity got the better of me. Now I'm hopefully not going to stray into TMI territory here but up to now, I was a fan of shower based hair removal (usually with a borrowed implement - sorry Mr SGS! )...quick and cheap. But frustratingly short term, especially during that lovely summer. One of my friends is an epilator fan and always raves about them but I had it in my head that they were instruments of torture so I never tried one. Turns out I was just being a wimp..
Epilator, various heads for small/large areas, shaving attachment and a charger. After you exfoliate your skin and you have the option of doing it when the skin is wet or dry, you hold the cordless epilator at a 90 degree angle to the skin and turn it on. Holding the skin taut helps to capture more hairs. There's a little light on this epilator and it was fabulous for showing up any wee hairs that I might have missed otherwise. I'll be honest - it's hard to remove hair for any decent length of time without some pain. We all know that. The epilator is basically a load of tiny tweezers pulling the hairs out. It's not an unbearable pain though - less childbirth and more like sunburn. Made easier as you are the one inflicting the pain and can anticipate it a bit better. What I will say is that as soon as you stop epilating, the pain stops. There is no lingering pain at all - just lingering hair-free legs. Now, in the interests of research, I tried it on my underarm and here it did hurt too much as the skin is so sensitive. Perfectly smooth legs for up to 4 weeks. Similar to waxing, the more you use it, the finer the hair becomes and the process becomes less painful too. Like any hair removal method, you'll avoid ingrowns if you exfoliate before using and regularly between treatments, use non-pore clogging body creams and if you use your epilator properly. Again, I'll be honest. I actually didn't exfoliate at all between my first two sessions (blame the kids and summer holidays) and I did get a few ingrowns but not the under the skin, painful bump ones, just a few hairs that were lying close to the skin and needed to be lifted up on my second treatment. You can read about ingrowns on this really useful link. Overall, I was pleasantly surprised. It wasn't as painful as I expected and the effects lasted longer than I expected. I did find the noise of it rather odd...it's got a menacing drone that sounded like it would hurt more than it does. If Mrs Remington could sort a silent one, it would be amazing. But its bark is most definitely worse than its bite. Now the Remington PR guys also sent me some lovely skincare products to use while trying out the epilator and I particularly wanted to share one of them as it has ended up being my ultimate product of the summer. This is amazing stuff. It's an instant tan so you put it on and you've got a colour. And it's pretty resistant to removal. You'll get a bit of rub-off on tight clothes but generally speaking, it stays put and only comes off with soap and water and a good rub. But, here's the best bit. It also has a gradual glow in it so you'll slowly build up a tan as you use it. 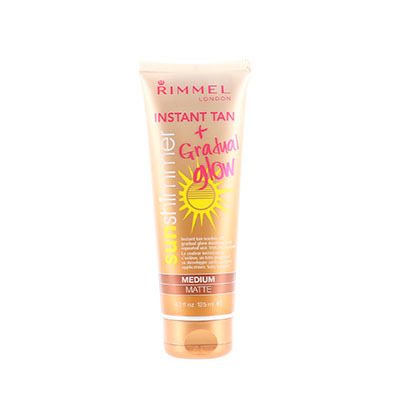 Now it's not as good as other gradual tans I've used but when combined with the instant, impossible to get wrong tan, it's a win/win. I literally used this every day of the summer. No streaks, no clogged up lumpy bits. And if you did make a mistake, you just gave it a rub with a facecloth, and you were sorted. Available for less than £6 delivered on the link above but it's also available in your local decent sized chemist though it seems to retail at between £7 and £9 here. Oh and before I go, I have to give the fig body butter by Korres a quick mention I am fig mad when it comes to fragrance and this body cream is sublime. And it's paraben free too! So obviously, I was given the epilator and the skincare products free of charge. This has not influenced my review at all and in fact, I was not under any obligation to blog about it anyway. But I did because I liked them all and continue to use them. I also thought there might be more women out there with an irrational fear of epilators and that I should do my bit to alleviate that. PS here's a little video (not by me) all about the Remington in case you would like more information..
Is it easy to clean afterwards? Where does the hair 'go'? I was given one too by a different company last year. Great for your legs but unbearable elsewhere! Quick and easy before work too especially as its been so warm this year. The hair is held mostly in the razor head which comes off and is easily rinsed under the tap. In this treatment the Hair Product Keratin are enclosed and locked in the cuticles of the hair strands by the use of the Brazilian Keratin Hair Straightener irons.